Note: The Canon Speedlite 550EX Flash has been replaced by the Canon Speedlite 580EX Flash. The built-in flash on Canon's Prosumer DSLR lines is generally considered inadequate for most serious purposes. The Canon accessory flashes such as the Canon Speedlite 550EX Flash are much more versatile and powerful. The 550EX gets the light far above the lens (prevents half-moon shadows in your pictures) and does a much better job preventing the red-eye effect. The 550EX allows bouncing the flash off of a standard height ceiling or off of other reflectors such as white walls, white foamcore, Photoflex and other commercial reflectors, ... The 550EX also allows the use of light softening and modifying accessories such as the Lumiquest Big Bounce, the Lumiquest Softbox, and the Sto-Fen Omnibounce. Another benefit of Canon's accessory flashes is that they significantly help focusing on many EOS cameras. A pattern of the focus assist light projected by the flash helps the camera focus faster and more accurately - even on a low contrast surface such as a white wall. The focus assist feature can make or break a shot in low light situations! The Canon Speedlite 550EX Flash is the largest and second most powerful of the Canon general purpose flashes. 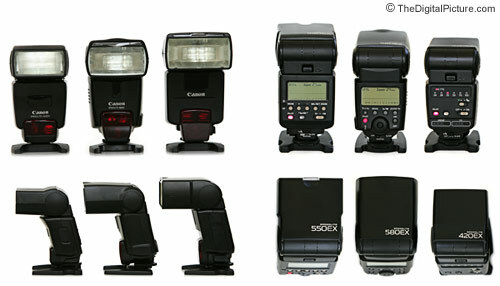 Pictured above are the Canon Speedlite 420EX E-TTL Flash (smallest), the Canon Speedlite 580EX E-TTL II Flash (middle) and the Canon Speedlite 550EX E-TTL Flash (largest). The Canon 550EX Flash is substantially larger than the Canon 420EX E-TTL Speedlite Flash, has more power, and many more features such as manual power selection, FEC (Flash Exposure Control) and manual zoom settings. Of course, it costs nearly twice as much as its sibling. 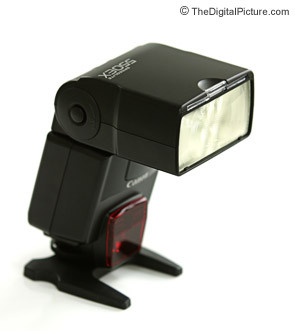 It is slightly larger, slightly less-powerful and somewhat less expensive than the Canon Speedlite 580EX E-TTL II Flash. Canon EOS 300D Digital Rebel owners should take note to the FEC (Flash Exposure Compensation) feature of the Canon Speedlite 550EX Flash. The Canon EOS 300D Digital Rebel does not have FEC built into the camera like most of Canon's other Digital SLRs. The 550EX will add a nice feature to your setup. One feature of the 550EX is that it can be a wireless Master to trigger remote flashes (via light) such as the Canon 420EX flash and the 550EX. The 550EX can also be used as a wireless slave to other 550EX or to a Canon ST-E2. I want to stress the importance of learning how to use Canon's E-TTL Flash system. The PhotoNotes link in my "More Canon Speedlite 550EX Flash Reviews" section below will get you well on your way to great flash photography results.